A battered husband set up a secret camera to film his drunken wife attacking him up because he didn't think police would believe him. 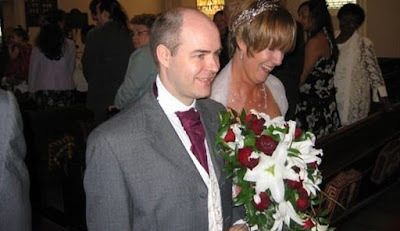 Neil Tweedy, 45, endured up to 12 years of physical abuse at the hands of school teacher spouse Helen, including an assault on their wedding night in which she smothered him with a duvet and forced him to sleep on the sofa. But for years, Mr Tweedy believed his heavy-drinking wife, also 45, would change and failed to report the attacks to authorities. After three incidents, he feared the attacks were escalating and handed over the footage to police. Mrs Tweedy admitted three charges of common assault by beating at Manchester Magistrates Court and was issued with a restraining order banning her from contacting her husband. The couple met 16 years ago and appeared to family and friends to be a happy couple. Prosecuting, Robin Lynch said: 'The complainant is the defendant's husband, they met in 2001 and within a couple of weeks moved into their current home address. 'The first three years were described by the complainant as 'amazing' but the defendant began to drink in private and there sometimes there was some controlling behavior. 'The defendant took over her husband's finances and told him that he had to hand over all of this wages to pay the bills. In 2005 on a family holiday they were with the defendant's parents and she shoved and pushed him and slapped him in the face. 'The complainant said from then on it became a regular thing. There were many happy times but it was not unusual at all for this to happen. 'Despite this, they married in 2008 but that night he was and assaulted and kicked and punched to the head and body. Magistrates sentenced Tweedy to a 12-month community order with 120 hours' unpaid work and a restraining order for 12 months. Mr Tweedy defended his wife's actions outside court, saying: 'Helen is a fantastic and brilliant teacher and gets to work for 7.30am and doesn't leave till 7.30pm. She's just so hard working. 'I don't support the restraining order as it will make access between her and our child difficult. 'We can't be amicable because of the restraining order but if there wasn't one in place then I'm sure we would be. 'The problem was just alcohol, she was admitted to hospital twice in the past year and could have died. 'Something had to change. It's not the kind of problem where she wakes up needing alcohol it's just the binge drinking at weekends that's caused this.